Thank you for your interest in our Safari Party Program! At this time we are no longer accepting reservations for parties. We expect our Safari Party Program to return in September 2018. 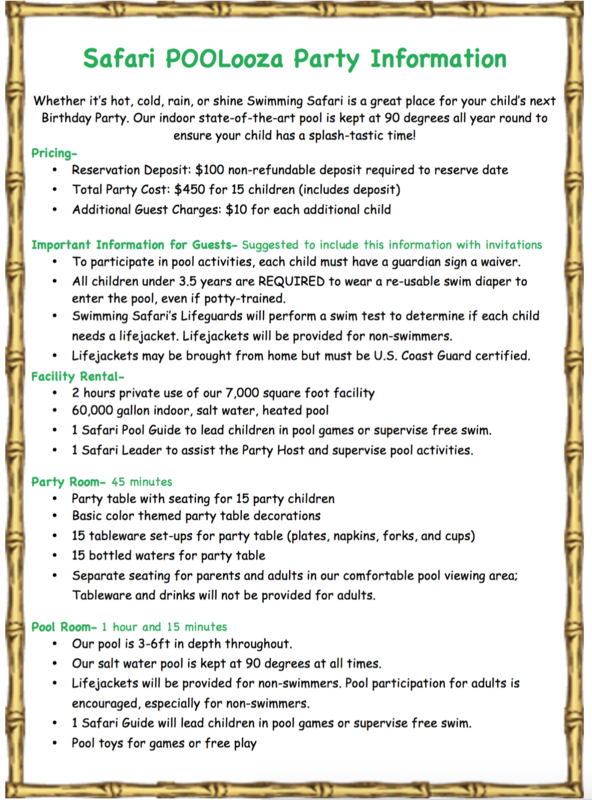 Enjoy a pool party at any time of year, with Swimming Safari Swim School! Hosting your birthday party at Swimming Safari Swim is great for children and adults alike! No matter what time of year your child’s birthday is, Swimming Safari Swim School is the perfect place to celebrate! Swimming Safari has put together a wonderful birthday package for you. Must be a current member of Swimming Safari Swim School to make party reservations. A non-refundable deposit of $100 is required at the time of reservation. This deposit will be applied to the outstanding balance, which is to be paid in full before the end of the event. To participate in pool activities, each child must have a guardian sign a waiver. All children under 3.5 years are REQUIRED to wear a reusable swim diaper to enter the pool, even if potty-trained. Swimming Safari’s Lifeguards will perform a swim test to determine if each child needs a lifejacket. Lifejackets will be provided for non-swimmers. Lifejackets may be brought from home but must be U.S. Coast Guard certified. When you are ready to book your Safari Party please give us a call at (904) 260-1836.